A hydraulic bottle jack is an automotive tool comprised of a hydraulic piston that is able to lift incredibly heavy objects. These hydraulic bottle jacks are primarily designed for commercial applications- they include fast-acting air pumps engineered to decrease the time it takes to lift heavy objects (Source). The Torin h﻿y﻿draulic jack is our to pick. It comes in either 4, 8, 10, 12, 20, 30, 50 ton models, with users saying that is professionally welded, unlike some Chinese knockoffs. Users particularly commend its quick release couple, its clean and tight welding, the small pneumatic tank that supplies the reserve pressure to the hydraulic system, and the insulated hose ends. Users describe lifting their motor-homes, as well as rotating their tires using this Torin hydraulic jack. That said, let's take a look at five of the best-selling options on the market today and see how they compare. 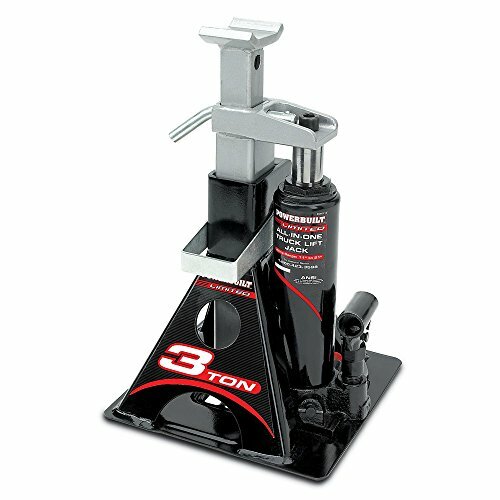 The inexpensive, 8lb Torin hydraulic jack is an effective option that lifts up to a height of 12.25 inches. Its users like that it is great at heavy-duty lifting, but also note that it leaks fluid. It has a steel frame, safe ratcheting head, glide action pressure pump and can lift up to 4 tons. 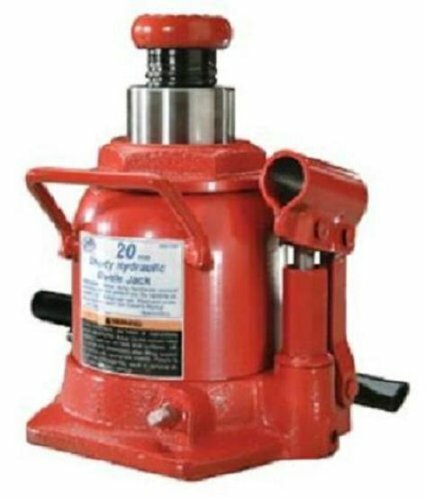 This jack is a worthwhile option if you are looking for a cheap hydraulic bottle jack. Reviews for the Torin T90403 Hydraulic Bottle Jack are somewhat mixed. Many users were very satisfied with the product and would recommend it. However, some users found that when they attempted to keep a load on it for a while it would slowly give out. One customer explained that it is useful for the odd job but shouldn’t be purchased for regular or long term use. Some users reported hydraulic fluid or oil leaking from the bottom after use. Another customer reported that after leaving it outside for a short period of time it began rusting. This 10lb, Pro-Lift B-006D is a well-constructed option that has a built-in bypass system to prevent ram over-travel. Its users like that it is very reliable, but also note that the handle is quite short. It’s about 10 inches tall, has an adjustable extension screw, is steel lifting saddle engineered, heat treated, manufactured in China, and it is designed to meet ANSI/PALD standards. This bottle jack is a formidable option if you are looking for a durable, long-lasting hydraulic jack for personal use. 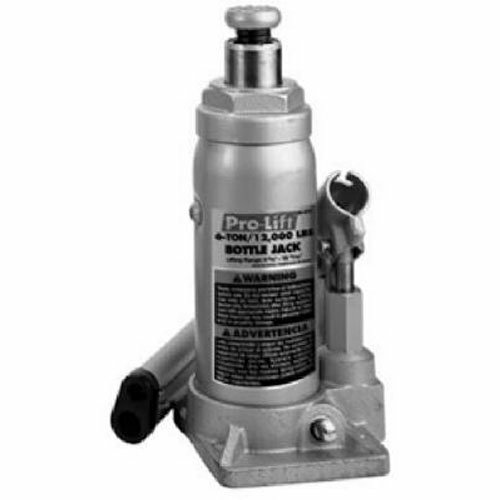 The general consensus for the Pro-Lift B-006D Hydraulic Bottle Jack is that it is a very sturdy and reliable product. Most consumers are very happy with its operation. Although a minority of users had difficulty with the short handle, this still did not negatively affect their opinion about it. One customer complained that the lift on it wasn’t as high as they needed it to be but they explained that this was expected given the type of jack it is. Most customers state that they are very pleased with the price. The reliable, 22lb 3-Ton bottle jack by Powerbuilt is a decent option that’s patented design combines the jack and jack stand in one unit. Its users are pleased that it is sturdy and long-lasting, but some users complain that it leaks hydraulic fluid. It is around a foot tall, has safety bars for locking the unit at the necessary height, and has a wide base to keep the load stable. 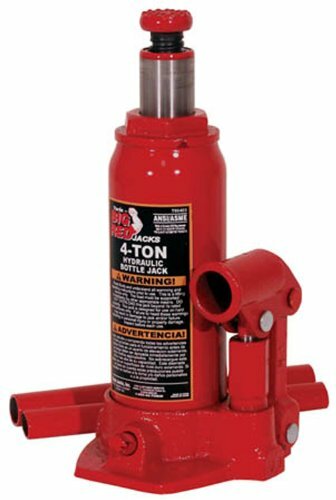 This all-in-one jack is a reasonable option if you are looking for a safe, inexpensive hydraulic bottle jack. Reviews for the Powerbuilt 640912 All-In-One Jack are relatively positive, although a large number of users reported hydraulic fluid leakage. One user stated that when raising it they noticed fluid spurting from the piston, while others simply saw large puddles on their garage floor. However, the majority of users state that they feel safe underneath a really heavy vehicle that is being lifted by this product. Some customers have reported that they had difficulty lowering the jack, and one claimed that it scratched the paint on their vehicle while attempting to lower it. Another customer said that they experienced the jack locking up while trying to lower it. 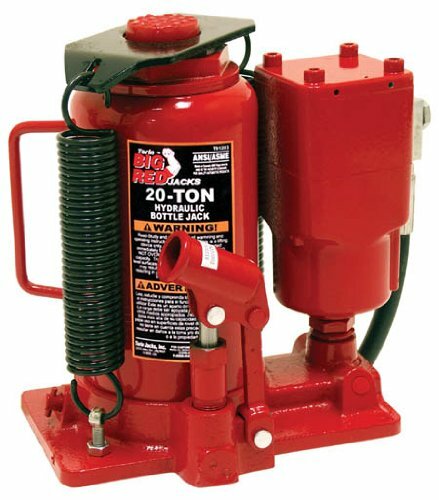 The sturdy, 23 lb, short hydraulic bottle jack from ATD Tools is a well-crafted option that has an operating force of 101 lbs. Its users say that it a high-quality jack, but also note that it does not work well in a horizontal position. It is around 6 inches tall, comes with two and three piece handle sets, has a patented built-in by-pass mechanism, has a screw extension of just over 1.5 inches and a saddle dimension of 2 inches. This short jack is a fantastic option if you are looking for a dependable, high-quality hydraulic bottle jack. Overall reviews for the ATD Tools 7387 Short Hydraulic Bottle Jack are extremely positive. Most customers praise the product for its safety and reliability. It is also very easy to use and works rather effortlessly. Many consumers were using it to lift heavy loads and found that they had no difficulty keeping the load in the air. Most users state that the price is very reasonable for what it is. The high-end, 40lb Torin air jack is a good quality option that includes a 4-foot air hose. 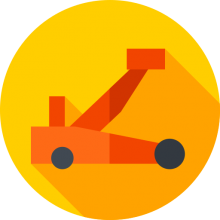 Its users like that it is great at lifting loads with relative ease, but also note that it is very noisy. It’s about 11 inches tall, is steel constructed and electronically controlled, has a head screw which turns up over 3 inches, and has a maximum lift height of roughly 20 inches. This air jack is a solid option if you are looking for an efficient hydraulic air jack. The general consensus on the Torin TA92006 Air Jack is that it is a high-quality product that is very reasonably priced. The pump action provides very little resistance and is easy to use. A few customers reported fluid leaks within a short while of use and some others reported air leakages. Some users stated that it stopped functioning after limited use, while others report having used it consistently for long periods of time with no troubles. Several consumers claim that the product did not work out of the package and were forced to get a refund. A bit hit and miss, apparently. It's important to exercise a great deal of caution when using one of these hydraulic bottle jacks- always place it on a solid level ground surface to ensure that there's enough stability to begin using it. To use a hydraulic bottle jack you should consult with your vehicle's owners manual to find the best lifting points and then also read up on the bottle jack's instruction manual to get a sense of how to use it. You will need to counterclockwise turn the piston ram so that it will unthread from the jack's bore. Once the piston ram is unthreaded you will have more space to work with the bottle jack- then you will just have to make some height adjustments of the piston ram. There will be a valve located on the bottom of the bottle jack- a screw that will be holding the pressure of the hydraulic system, which when released will trigger the hydraulic pressure. You will then be able to make use of the bottle jack handle, working it as a valve until the piston ram is able to raise. The next step is to insert the handle assembly directly inside of the pump shaft. You will then proceed to pump the handle smoothly with up and down strokes. Every time you pump the hydraulic piston will cause the bottle jack to raise. You will need to be extra careful if you are lifting something that is especially heavy like a car or truck. Once you reach the desired height, you will then be able to remove the handle that had been inserted in the pump shaft. To lower the bottle jack, you will have to turn the valve in a counterclockwise direction very slowly- if you were to open the valve too quickly the piston would drop very rapidly and cause you to harm yourself or whatever you are lifting. If you are in the market for a hydraulic bottle jack, check out our comparison table above, read our individual reviews, and also check out the product pages of the bottle jack you are looking to purchase- this is a great way to get a sense of what other users are saying about the jacks they purchased.